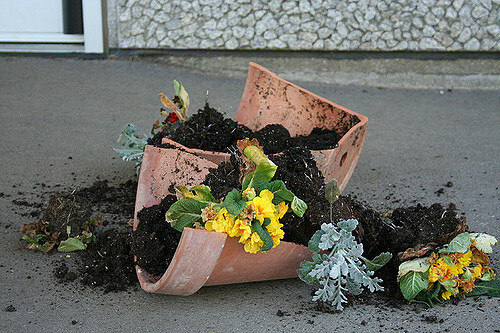 I used the idea of a broken plant pot to symbolise the life of a homeless person in my descriptive writing. A shard of a broken plant pot is rigid and sharp like a homeless person’s soul; they push people who try to help, broken down by everything that has ever happened to them. The soul inside them has been broken down into hundreds of thousands of tiny pieces, each carrying a single different emotion such as dismay, hopelessness and loneliness. Day by day people pass by, not noticing the man with nothing. Dirty and broken is all people see, not willing to lend a helping hand. Tired and worn is how a homeless person is seen – someone who wasted his future on drink and drugs, when truly everyone has a different story to tell about how they fell down the spiral of homelessness. His sharp persona questions everything, just because he always has to keep his guard up and this repels people who see only the rude manner. But always remember how fragile a person can be when something catastrophic happens. The bonds that keep us together can break them down completely.